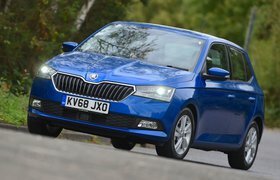 2016 Skoda Fabia 1.2 TSI 90 Monte Carlo review | What Car? Skoda isn’t hanging around in fleshing out the showroom range of its 2015 What Car? Car of the Year, the Fabia supermini. There are two new mid-level trim levels on offer today that weren’t available when the car was first launched at the beginning of 2015, and one of them is the ever-so-slightly racey Monte Carlo edition, a version of the car inaugurated on the previous-generation Fabia and originally intended to mark the centenary of the rally on the French Riviera, as well as the 110th anniversary of Skoda in motorsport. Specialising in sporting flavour for a modest budget, the Monte Carlo is based on mid-level SE trim but adds 16in painted alloy wheels, sports front seats, sporty pedals and a red-stitched sports steering wheel. Meanwhile, tinted windows and gloss black body trim help to lift the car’s exterior styling above the slightly dowdy level of the standard car. The cost for the upgrades comes to £1825. Three petrol and two diesel engines are on offer in the car, allowing owners to balance sporting zest against running costs to their own particular liking. And for those who want to maximise the sporty side, 17in wheels and sports suspension are offered as options. Our test car – a mid-range 89bhp 1.2-litre TSI – had neither. What is the 2016 Skoda Fabia 1.2 TSI 90 Monte Carlo like to drive? It's very respectable – but with this engine and specification at least, it’s a little guilty of talking the talk of a vivacious little driver’s car but not quite walking the walk. The lesser of Skoda’s two 1.2-litre turbo engines for the car is willing enough and pulls with plenty of guts at low revs, making the Fabia feel peppy around town. But it runs out of breath as you work it to high engine speeds – and that’s precisely what the five-speed manual gearbox, with its spaced-out ratios, obliges to you do in order to spirit the car along with any vigour. Overall, although the engine’s pulling power makes the Fabia feel quite obliging, it struggles and ultimately fails to command a distinguishing pace and likewise to feel very athletic. Changing gears is easy enough, through a light but nicely defined shift action – although a long throw takes some immediacy and fun out of the equation. 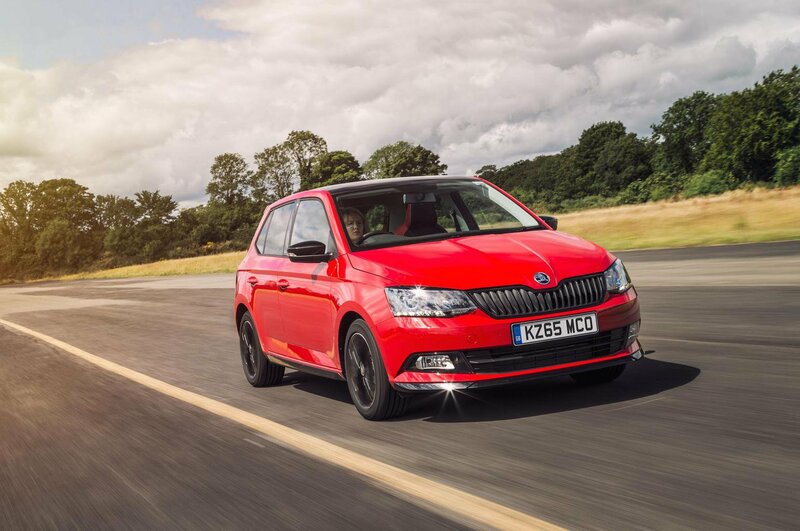 The car’s ride and handling is, by and large, just as rounded and mature as that of any other Fabia in the range. Those painted wheels add a little more bite to the front wheels, and the car’s spring rates balance suppleness against body control quite well – but that’s quite well for an ordinary supermini and a bit limply for a warmed-up option. Gentle-acting shock absorbers aren’t much use at keeping the car’s body tied down when the road turns bumpy and the car’s steering offers little tactile encouragement. What is the 2016 Skoda Fabia 1.2 TSI 90 Monte Carlo like inside? Skoda’s standard-fit cloth upholstery is a veritable riot of red, white and grey stripes, and its colours are echoed on a cherry red centre console. The combined effect won’t be to everyone’s taste, but it’s a welcome injection of colour in an otherwise monotone interior. The front seats themselves are quite deeply bolstered for a warm supermini, and they’re relatively small – but the cushion bolsters yield just enough to accommodate larger occupants. Space in the rear seats is generous by small car standards, and even more so in the boot, making the Fabia more practical than most small cars and no less so in this case. It’s also about as solid and robust-feeling inside as anything you could buy on a similar budget, with switchgear and materials that aren’t desperately expensive-looking but are well finished and feel like they’ll last. The car gets no more infotainment equipment thrown in than the Fabia SE, so you get a 6.5in touchscreen system with Bluetooth, DAB and smartphone mirroring as standard. As long as you’re buying it for the right reasons. The Fabia vRS is now dead and gone and the Monte Carlo isn’t a replacement for it. This particular one does a good job of lifting the appeal of the car’s exterior styling and adding colour and life to the cabin, but – without Skoda’s sport suspension, at least – it doesn’t have a driving experience ready to light up your weekends.